Premium Leisure, LLC (“Premium Leisure”) provides a limited Warranty for the Premium Spas (the “Spa”) in accordance with the time periods and other terms and conditions described below (the “Warranty”). If you have any questions regarding Warranty issues, please contact us. Structural and Manifold Plumbing Parts (Lifetime): Premium Leisure warrants the Spa’s shell structure against the loss of water through the fiberglass laminate of the shell caused by defects in materials and workmanship. Premium Leisure also warrants that the plumbing manifold system (i.e. manifold, fittings and related parts) will be free from defects in materials and workmanship. The Warranty for these components covers only parts and extends for as long as the original purchaser owns the Spa. Spa Surface (Five (5) years, pro-rated): Premium Leisure warrants the Spa’s interior acrylic spa surface against blisters, cracks, or delaminating resulting from a defect in materials or workmanship of the acrylic surface material for a period of five (5) years from the original date of purchase. The Warranty for the acrylic spa surface covers both parts and labor, and is pro-rated based on the following formula: Suggested retail price divided by months covered (60), multiplied by months owned plus shipping = replacement cost. Major Spa Components (Five (5) years, pro-rated): Premium Leisure warrants the Spa’s major electrical equipment (electrical system, Spa controls and motors) to be free of defects in materials and workmanship for a period of two (2) years from the original purchaser’s date of purchase. The Warranty on these components covers only parts, such replacement parts to be obtained directly from Premium Leisure or Assigned Agent, and defective parts returned to Premium Leisure Assigned Agent. Prorated formula: Year 1-2, manufacturer covers 100% of component replacement cost based on MSRP of component. Year 3, manufacturer covers 75% of component replacement cost based on MSRP of component. Year 4-5, manufacturer covers 50% of component replacement cost based on MSRP of component. Cabinet (Two (2) year): Premium Leisure warrants the Spa’s simulated wood cabinet, including the materials, structural integrity and assembly of the cabinet, will be free of defects in materials and workmanship for a period of two (2) year from the original purchaser’s date of purchase. The cosmetic finish of the Spa’s wood cabinet is warranted to be free from defect in materials and workmanship at time of initial delivery. Fading and weathering of the cabinet surface may occur naturally over time and shall not be considered a defect. To restore the appearance of the Spa’s wood cabinet, please refer to the Spa’s owner’s manual for proper care and maintenance instructions. Other Spa Components and Optional Accessory Items: All components of the Spa not described above are covered by a 90 day, parts only, Warranty. These components include, but are not limited to, the Spa’s optional accessory items such as optional fixtures, trim kits, skirts, stereos, MP3 players and other music and video devices, ozone, waterfall assemblies, and lighting systems. All perishable, cosmetic or owner serviceable items, spa cover, light bulb, light lenses, fuses, headrests, filters, cover-lift, spa drain, jet inserts, etc. are warranted to be free of defects in materials and workmanship at the time of the Spa’s delivery. Certain items described in this paragraph may be covered by a separate manufacturer’s Warranty. Premium Leisure may serve as an agent in presenting claims under these manufacturers’ warranties, but will not be responsible if such Warranty claims are limited or denied. In the event Premium Leisure provides parts to replace an alleged defective part covered by an independent manufacturer’s Warranty, the Spa owner will be responsible for the item’s cost and applicable shipping charges, and will be credited with item cost upon the manufacturer accepting the Warranty claim and providing Premium Leisure with a replacement item. Warranty Performance: In the event of a suspected defect covered by the terms of this Warranty, the Spa owner must notify us within a reasonable time and use all reasonable means to protect the Spa from further damage. For a period of two (2) years a service representative will provide the technical labor only, to affect the repair subject to the terms and conditions contained in this Warranty. The service representative may assess reasonable travel charges. Visits to simply diagnose, troubleshoot, or inspect problems are not covered under this Warranty. If we determine that repairs are not feasible due to functional defect, we reserve the right to provide a replacement part or spa in lieu of repair. We will replace with a part of value equal to the original purchase. In such event, owner is responsible for expenses including removal, shipping, and re-installation of the existing or replacement Spa. The replacement Spa or part will carry the balance of the original Spa’s Warranty, if any. 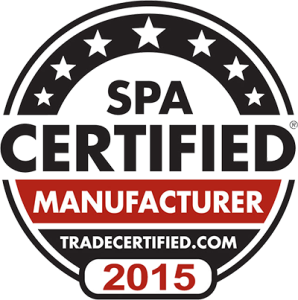 This Warranty applies to spas sold after November 1, 2014, and takes effect from the date the Spa was originally purchased or six months from the date of manufacture whichever comes first. This Warranty applies only to the original purchaser and terminates with any transfer of ownership. This Warranty does not apply to a Spa used for any commercial, rental, club purposes, or for any Spa used outside of the United States. All Warranty claims must be accompanied by a sales invoice showing date of purchase. This Warranty does not cover damage resulting from moving the Spa, abuse, misuse, or neglect, including but not limited to any installation, operation, maintenance or use of the Spa other than in accordance with the Spa’s Owner’s Manual. Also excluded from this Warranty is coverage for damage caused by (a) operation of the Spa at water temperatures outside the range of 32 and 104 degrees Fahrenheit, (b) dirty, clogged, or calcified filter cartridges, (c) improper use of chemicals or cleaning agents, (d) allowing un-dissolved spa sanitizing chemicals to lie on the surface, (e) improper pH balance or other improper water chemistry, (f) failure to provide even and sufficient structural support for the Spa, (g) repairs or alterations performed by anyone other than a Premium Leisure authorized service representative, and (h) acts of God (including lightning strikes), nonstructural normal wear and tear, cosmetic blemishes and other causes beyond Premium Leisure’s control. The Warranty is in lieu of all other warranties, expressed or implied, including implied warranties of merchantability and fitness for a particular purpose. In no event shall Premium Leisure be liable for incidental or consequential damages. The Spa owner is required to provide unencumbered access to the Spa for any Warranty repair or inspection. Premium Leisure shall not be liable for loss of use of Spa or other incidental or consequential costs, expenses or damages, which may include, but are not limited to water damage, or the removal of a permanent deck or other customer fixture. Under no circumstances shall Premium Leisure, or any of its representatives, be held liable for injury to any person or damage to any property, however arising. This Warranty gives you specific legal rights and you may have other rights. Premium Leisure’s waiver or failure to enforce any of the terms or conditions of the Warranty shall not in any way affect, limit or waive its right at any time to enforce strict compliance with every term and condition thereof. No service company or other party is authorized to change, modify, or extend the terms of this Warranty in any manner whatsoever. The jurisdiction and venue for any litigation arising with respect to the transaction evidenced by this Warranty shall be the Circuit Court in and for Pinellas County, Florida, and any party submitting a claim under this Warranty hereby agrees to such jurisdiction and venue. Premium Leisure LLC warrants the swim spa shell structure against the loss of water through the fiberglass laminate of the shell caused by defects in materials and workmanship for as long as the original purchaser owns the swim spa. Contact manufacturer if you have any questions concerning warranty issues. Premium Leisure LLC Warrants the interior acrylic swim spa surface against blisters, cracks, or delaminating resulting from a defect in the acrylic surface material for a period of five (5) years from the date of purchase, based on the following formula: Suggested retail price divided by months covered (60), multiplied by months owned plus shipping = replacement cost. Premium Leisure LLC warrants the plumbing manifolds, fittings, and parts to be free of defects in materials or workmanship for as long as the original purchaser owns the swim spa. Premium Leisure LLC warrants the electrical equipment and components to be free of defects in materials and workmanship for a period of two (2) years on major swim spa components (electrical system, swim spa controls, motors) and two (2) years authorized field service on these items. Ninety (90) day (Parts ONLY) Limited Warranty on all optional accessory items (optional cabinets, fixtures, trim kits, skirts, CD & MP3 players, all other music and video devices, ozone, waterfall assembly, LED lighting, etc). All perishable, cosmetic or owner serviceable items, swim spa cover, light bulb, light lenses, fuses, headrests, cabinet, filters, cover-lift, swim spa drain, jet inserts, etc are warranted to be free of defects in materials and workmanship at the time of delivery. These items may be covered by a manufacturer’s warranty, which may have a longer duration than this Limited Warranty. Premium Leisure LLC may serve as an agent in presenting claims under the manufacturers’ warranties, but disclaims any liability there under. In the event Premium Leisure LLC provides parts to replace an alleged defective part under warranty owner will be billed for the cost thereof and credited, minus freight, upon both the defective part being returned to Premium Leisure LLC and the manufacturer of said part accepting warranty claim. In the event of a suspected defect, under the terms of this Limited Warranty, notify manufacturer. Use all reasonable means to protect the swim spa from further damage. A service representative will provide the technical labor only, to affect the repair subject to the terms and conditions contained in this Limited Warranty. The service representative may assess reasonable travel charges. Visits to simply diagnose, troubleshoot, or inspect problems are not covered under this Limited Warranty. If we determine that repairs are not feasible due to functional defect, we reserve the right to provide a replacement part or swim spa in lieu of repair. We will replace with a part of value equal to the original purchase. In such event, owner is responsible for expenses including removal, shipping, and re-installation of the existing or replacement hot tub. The replacement swim spa or part will carry the balance of the original swim spa’s warranty, if any. Either party’s waiver of any breach or failure to enforce any of the terms or conditions of the warranty shall not in any way affect, limit or waive such party’s right at any time to enforce strict compliance with every term and condition thereof. This Limited Warranty applies to swim spas sold after January 1, 2008. This Limited Warranty takes effect from the date the unit was originally purchased or six months from the date of manufacture whichever comes first. This Limited Warranty applies only to the Original Purchaser and terminates with any transfer of ownership. This Limited Warranty does not apply to a swim spa used for any commercial, rental, club purposes or for any swim spa used outside of the United States. The purchaser must establish the date of purchase by dated sales invoice of delivery receipt. This Limited Warranty does not cover damage resulting from abuse, misuse, or neglect including any installation, operation, maintenance or use of the swim spa other than in accordance with the Owner’s Manual of the swim spa. Damage caused by operation of the swim spa at water temperatures outside the range of 32 degrees F. and 120 degrees F., damage caused by dirty, clogged, or calcified filter cartridges, damage to the swim spa surface caused by improper use of chemicals or cleaning agents, allowing un-dissolved water sanitizing chemicals to lie on the surface, damage caused by improper pH balance or other improper water chemistry, damage caused by failure to provide even and sufficient support for the swim spa, are considered abuses and may invalidate this Limited Warranty. Damaged caused by repairs or alterations performed by anyone other than an authorized service representative is not covered. Failure caused by accidents, acts of God, nonstructural normal wear and tear, cosmetic blemishes and other causes beyond our control are excluded. The warranty is in lieu of all other warranties, expressed or implied, including implied warranties of merchantability and fitness for a particular purpose. In no event shall manufacturer be liable for incidental or consequential damages. The swim spa owner is required to provide unencumbered access to the swim spa for any warranty repair or inspection. Manufacturer shall not be liable for loss of use of swim spa or other incidental or consequential costs, expenses or damages, which may include, but are not limited to water damage, or the removal of a permanent deck or other customer fixture. Under no circumstances shall we, or any of our representatives be held liable for injury to any person or damage to any property, however arising. This warranty gives you specific legal rights and you may have other rights. No service company, or other party is authorized to change, modify, or extend the terms of this Limited Warranty in any manner whatsoever. The jurisdiction and venue for any litigation arising with respect to the transaction evidenced by this warranty shall be the Circuit Court in and for Pinellas County, Florida and Buyer hereby agrees to such jurisdiction and venue.